Park developments for the Silver Lake Park project, renamed as Settlers Park. The Grapevine Parks and Recreation Department has planned park developments for its Silver Lake Park project, renamed as Settlers Park (located across from the intersection of SH 26 and Bass Pro Drive). Developments include pedestrian trails, nature trails, drainage improvements, park signage, boardwalks, pavilion, terraced seating, primitive camping, overlook, picnic facilities and a fishing pier. The project includes a 19.4 acre land donation from Grapevine Equity Partners, LLC. Approximately six acres will be developed, approximately ten acres will be dedicated as preserved natural open space including the pond, mature wooded areas and low-lying wetland areas and the remaining three acres are to remain undeveloped. The developed six acres will help the Department practice, encourage and enable science-based stewardship of natural and cultural resources and increase access to and participation in the outdoors. The department intends to provide a variety of high-quality, nature friendly outdoor recreational activities at Settlers Park such as: fishing, hiking, wildlife viewing stations, kayaking, etc. In addition, the new trails will connect to the over 67 mile city-wide trail system and link over 1,000 acres of park space. 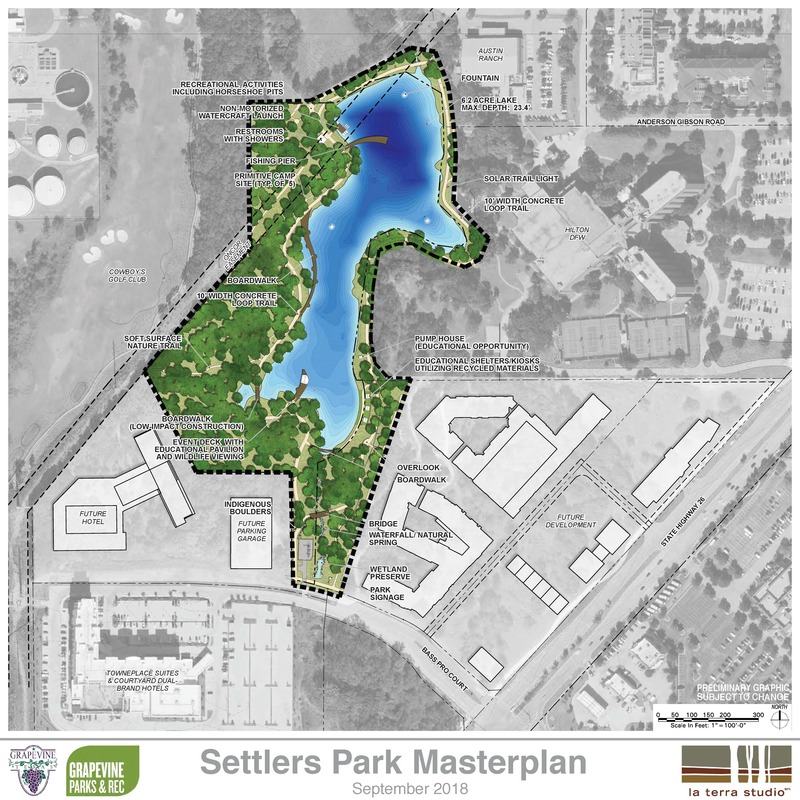 The development of Settlers Park addresses several current and future recreational needs for citizens, including additional trails, fishing piers, and conservation of open space and natural areas. This project would not be possible without the in-kind donation of the land and pond from Mehul (Mike) Patel, Chairman and Chief Executive Officer of NewcrestImage and the Texas Parks and Wildlife Commission awardeding the City of Grapevine a $500,000 non-urban outdoor grant for Settlers Park.